Elements of Power Systems is designed as an undergraduate-level textbook, but the book also makes a handy reference for practicing power engineers. Pradip Kumar Sadhu holds bachelor, post-graduate, and Ph.D degrees in electrical engineering from Jadavpur University, West Bengal, India. Dr. Sadhu has 18 years of experience in teaching and industry. Currently, he is a professor and head of the Electrical Engineering Department of the Indian School of Mines, Dhanbad, where he has guided a large number of doctoral candidates and M.Tech students. He holds four patents, has been published in several national and international journals and conference proceedings, and is principal investigator of a number of government-funded projects. Soumya Das holds a B.Tech from the West Bengal University of Technology and an ME from Jadavpur University, West Bengal, India. He is currently pursuing his Ph.D with the Department of Electrical Engineering at the Indian School of Mines, Dhanbad. He is also an assistant professor in the Electrical Engineering Department of the University Institute of Technology, Burdwan University, West Bengal, India, where he has guided a large number of B.Tech and M.Tech students. Previously, he was an assistant professor in the Electrical Engineering Department at the Bengal Institute of Technology and Management, Santiniketan, India. "… a very good contribution that covers many aspects of power systems and components. … I strongly believe that this book will be interesting for students and professionals in electrical power engineering." "… provides an important resource for engineers, instructors, applied researchers, and students in the field of power engineering. … This well-written book offers broad coverage of important issues, operating concepts, and control techniques commonly addressed in most textbooks regarding power systems." "... a very good choice as a complete reference for power systems. Readers will find it worthwhile for their collections and self-reading material." "This book offers a simplified and summarized presentation of the majority of topics related to electric power systems. Sadhu (Indian School of Mines) and Das (Burdwan Univ., India) review and briefly discuss the foundations of a particular area in each of the book's 20 chapters. 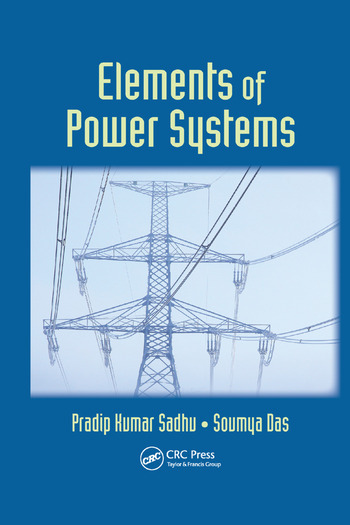 The first four chapters are an overview of basic concepts and terminologies employed in power systems engineering. The next six chapters focus on power overhead transmission lines and underground cables. They also cover issues related to transmission lines, such as corona and electrical insulation. Electric power distribution systems, earthing, and substations are presented in separate chapters. The book goes on to discuss elements of power system protection, including relays, circuit breakers, and fault analysis. Concluding chapters deal with power system stability and load flow. The authors have reduced the mathematical and physical complexities that one may encounter in each of these topics as much as possible, allowing the general reader with some background in power systems to benefit from the book. The worked examples and end-of-chapter questions are very helpful for understanding the material."